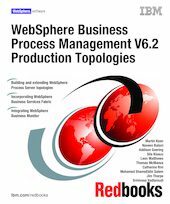 This IBM® Redbooks® publication addresses the configuration, administration, and security of the key runtime environments in WebSphere® Dynamic Process Edition V6.2. Part 1 of this publication introduces production topology concepts and terminology, and provides security considerations. In Part 2, through a series of step-by-step instructions you will learn how to select and create a production topology environment based on WebSphere Process Server deployment environment patterns. You will learn how to secure this environment and administer it. This part also contains chapters on extending these topologies, monitoring them with IBM Tivoli® Monitoring, and accessing them with Business Space powered by WebSphere and Lotus® Forms Client. Part 3 extends the Remote Messaging and Remote Support production topology for WebSphere Process Server, describing step-by-step how to add WebSphere Business Services Fabric and WebSphere Business Monitor to that topology. Finally, Part 4 describes how to build a complete WebSphere Dynamic Process Edition production topology from the ground up using the new Four Cluster production topology.